I had the opportunity to hike 42.5 miles of the North Country Trail in Pictured Rocks National Lakeshore the last week in August. With the exception of a two-day/22 mile initial test run a month earlier, this was my first real shakedown trial for both gear and stamina. I packed five days worth of food and the warmer clothes I expect to carry on the first weeks of next year’s thru-hike. I was thrilled to be hiking my first 7.3-mile long day in the rain. I could finally put the pack cover, a new Marmot Precip rainjacket and the ULA rain kilt to the test. 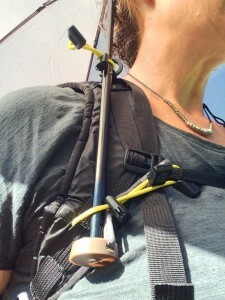 I also unfurled the SnowPeak® Ultralight umbrella. I’ve never considered packing an umbrella before this year. Seems a bit superfluous. But I had read an ultralight backpacking advice book by repeat PCT thru-hiker Ray Jadine (Ultralight: The Ray Jadine Way) and thought I’d give it a try. Let me tell you! It sure was worth carrying the equivalent of a deck of cards. I appreciated every inch of those additional 4.7 ounces. The rain was showering down as I departed the visitor center. I stayed protected under my 33” dome of dryness. The wind tried to blow the rain into my face. The little umbrella bowed under pressure, but kept the water at bay. I set up my tent in the rain, but my backpack remained dry(er) while parked under the umbrella. Later, I walked over to the campsite’s metal bear box carrying my food bag in one hand and the umbrella in the other. That bag stayed dry. While not as easy, I also was able to keep it perched over my shoulder while I hunkered down to cook and eat dinner. 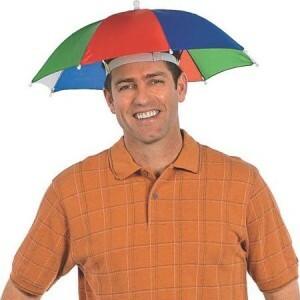 Finally, it doubles as your personal parasol when shade is lacking. My ULC Circuit backpack already includes bungee cording on the shoulder straps. With only a little creative manipulation, it worked well for securing the umbrella. You may need to experiment with Velcro or other cords on backpack models that lack additional stays. You’ll probably want to walk hands free while remaining under the protection of your personal rain shelter. Ultralight umbrellas are available through a few manufacturers including Sea to Summit and Snow Peak. Ray Jadine also explains how to modify existing umbrellas in his publications. See you on the trail next spring ready for April (and May and June and July…) showers. And by opportunity, I mean that work was slow and I could duck out for a week unnoticed. Also my local Y was closed for renovations. Another one of the top trails to hike within your lifetime, according to Backpacker magazine and me. The Ice Age Trail is largely flat. Even in August, it is never a bad idea to pack a winter jacket when visiting Lake Superior. Predictions were for clearing skies beginning the next day. Very happy with this purchase, but the temps also never exceeded 50 degrees on the two days I wore it while the rain fell. Kept me dry and warm, but never overheated. The rain kilt also ROCKS! Lightweight, water and wind resistant. Even kept me warm and it doubled as a good “sit-upon” on the wet ground. I imagine the ventilation will perform better than rain pants under hotter, summer conditions. Not to be confused with its cheap cousin, the rainbow umbrella hat. Yet another piece of gear to keep track of and carry? And an initial measure of patience. In 2011, I thru-paddled the 740-mile long Northern Forest Canoe Trail. I was a 2016 A.T. flip-flopper, but my thru-hike attempt ended after 1300 miles. I started in Shenandoah National Park and four months later I summited Mt. Katahdin on August 23. Turns out, I did miss being on water instead of worrying about finding and carrying it. When I returned home after Katahdin, I headed up to Ely, Minnesota unwinding with a little 150-mile, two-week solo canoe trip in the Boundary Waters Wilderness. During the winter, I decided I should finish what I started and headed back to the A.T. on May 2, 2017 departing from Springer Mountain. I arrived at Rockfish Gap on June 30, amidst families taking photos by the park entrance and wondering why anyone would be tearing up so much by a roadside sign. Since being introduced umbrellas by PCT hikers on the AT I am a convert. I bought a Golite and had it delivered to the trail at Daleville and hiked with it to Maine. Since then I have used it on most hikes and take it on all hikes. Last week I purchased a Six Moons Design hiking umbrella. I agree. Saw your post about raingear just after writing this one. Also–love your YouTube video “What People Think It is Like.” A friend emailed it to me to watch. Kind of relates to my new latest post.